At the heart of cloning are restriction enzymes. Restriction enzymes are a common tool in any molecular biology lab. Need to know how large your plasmid is? Cut it with a restriction enzyme. Need to chop your genomic DNA into smaller pieces for a southern hybridization or to prepare a library? Use a restriction enzyme. Need to put a piece of DNA into a vector (i.e., cloning)? Then, you guessed it, use restriction enzymes. Restriction enzyme cloning takes advantage of the site specificity of these enzymes. The enzymes only cut (or “digest”) at specific DNA sequences —usually plasmid DNA in cloning. This specificity allows you to insert or ligate another piece of DNA at those sites. The plasmid can then be replicated in a bacterium, allowing the researcher to produce copies for other experiments. How Does Restriction Enzyme Cloning Work? The procedure for restriction cloning is quite simple. Restriction enzymes digest the plasmid, you prepare an insert either from another plasmid or one you synthesized, and last, T4 DNA ligase ligates the plasmid and insert. Then, you transform the ligated plasmid into a bacterium (usually E. Coli). The problem, of course, is that the devil is in the details. The choice of restriction enzyme has to be carefully planned. Additionally, since enzymes cut at specific locations, the experiment must be designed precisely so as not to introduce any frame shifts or mutations during the process. What Exactly Are Restriction Enzymes? Restriction enzymes are also known as restriction endonucleases. The first of these enzymes was found by observing that a phage was able to be grown in one strain of bacteria, but not another (1). After investigation, it was discovered that the reason the phage growth was restricted (hence the name) was certain bacteria lines had the ability to chop up the phage DNA, preventing infection. Upon further study, an enzyme was found that was ultimately responsible for cutting the phage DNA not present in phage-susceptible bacteria lines. Today, researchers have found thousands of different enzymes that can be used for cutting DNA, hundreds of which can be purchased from suppliers with easy-to-use buffer systems. Additionally, there are plenty of tools online, such as NEBcutter that can be used to find restriction enzyme cut sites in a given DNA sequence. 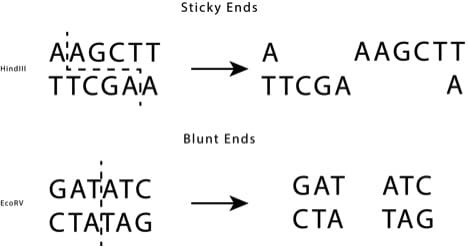 When a restriction site is cut by an enzyme, it can either do so at the same location on the top and bottom strands, leaving blunt ends, or at different locations on each strand, leaving “sticky ends” (See figure). Producing sequence overhangs means that only the insert with the complementary sequence will be able to bind to the overhang. Therefore, sticky ends are easier to adhere together and will be more stringent. The downside, of course, is that only very specific sequences will be compatible after digestion. If you want to insert a piece of DNA from, say, another plasmid, then the restriction site has to be in your region of interest. Sometimes this can be avoided, however, because different enzymes can leave the same overhangs, called compatible cohesive ends. Let’s say that you want to insert a piece of DNA into a plasmid. Well, if you cut the plasmid DNA with one enzyme, then there’s nothing to prevent the plasmid from ligating to itself—instead of your insert. In order to prevent the plasmid from re-ligating, a phosphatase is used to remove phosphate groups from the ends of the plasmid DNA. DNA ligases require the presence of phosphate groups on the ends of DNA. Therefore, with those phosphate groups missing from the plasmid DNA, ligation will only be possible using the phosphates on the insert sequence. This can be further improved by isolating the excised DNA from a gel, and removing any trace of the source DNA it was removed from. Blunt ends, while more difficult to successfully clone, have the advantage of being compatible with each other no matter what restriction enzyme was used to produce them. Unfortunately, any blunted DNA strand will be available for T4 DNA ligase during ligation, meaning there is no way to control orientation. This is especially true if both cuts used for excision are blunted. Once the source and destination DNA has been digested and cleaned it is ready to be ligated together. This is accomplished by using the enzyme T4 DNA ligase, which joins together double-stranded breaks of compatible DNA ends. The enzyme is capable of joining both blunt and sticky ends, though the efficiency of joining together blunt ends is much lower. Using T4 ligase is easy. Simply mix the DNA, ligase, and buffer together and let incubate. It is important at this point to consider the molar ratio of all of the components, but there are lots of tools available to help like this one. Many commercial ligases allow incubation at room temperature and can be completed in less than half an hour for sticky ligations. Once ligation is complete, a small amount of the mixture can be transformed into competent cells to complete the cloning procedure. Restriction cloning has revolutionized molecular biology since it was first introduced. The individual steps are quite simple, however putting them all together and getting them to work can be a different story. Luckily, there are plenty of resources available, including on Bitesize Bio to help you along the way. Good luck!